Start off with a clean base by using Angel Rinse and Angel Wash. 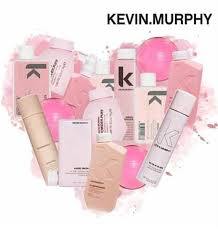 This is a light weight shampoo and conditioner that will revitalize fine hair; encouraging more volume. Next, we use Body Builder. This volumising mousse gives extreme fullness while having a flexible hold. We suggest working the product into the hair and evenly distributing it from roots to ends. Begin rough drying the hair with your dryer at a medium setting. You should want about 80% of the moisture removed from the hair. Once the majority of the moisture is removed from the hair, begin drying it with a round brush of your choice. We suggest sectioning your hair into 3 vertical sections. Starting at the front of the face from the nape of the neck upwards, you would want to make sure to over-extend the sections while drying. For a more bouncy look, try leaving the round brush, wound up, in the hair while using the cold shot function on your blow-dryer. This will help set the “curl”. Finish off your look with Shimmer Shine spray to add shine and protection from environmental factors. Stylists and clients alike have fallen in love with the Olaplex No.3 Treatment. They have been using it to achieve that perfect “bounce dry” look. Olaplex is great because it can be used on all hair types. Olaplex works from the inside-out to repair damaged hair, but unlike moisturizing treatments, it leaves the hair light and bouncy. We suggest that you apply Olaplex No.3 on towel dried hair once a week (2-3 times a week for sensitized hair) and style as usual. Instantly, your hair will look fuller, softer, and your blowout will last much longer. At your next hair appointment, ask your stylist for an Olaplex Mini Treatment to see how Olaplex can benefit your hair!